Growing up in Roanoke Virginia, Tanglewood defined my perception of malls. In its heyday in the mid-80's (before the opening of Valley View) the mall had a thriving mix of upscale and discount retailers and national chains. But what I will always remember most vividly was the atmosphere and smell of that mall. There were 3 large fountains in Tanglewood, with 1 located by each of the 2 main entrances. They were the kind of fountains you don't see too often in malls anymore. They had a really strong discharge, often 10 feet high or more, which cooled the air around them and had somewhat of an ionizing effect, giving the air the clean, humid scent similar to the smell after a good rain. At the time I last resided in Roanoke, I was 13 and my mother did not drive. We would walk a mile or so to the mall, often on hot days. What a nice effect those fountains had to one who just came in out of the heat! The touch of moisture they added balanced the air conditioning, which made the air seem more like a cool outdoor breeze than the bone dry, freezing air common to most malls nowadays. They also had a much needed humidifying effect in winter. Best of all was the combined odor of the water and assorted retail establishments, especially the Baskin & Robbins ice cream located by the entrance Mom and I most often used. Talk about inviting, especially to a kid who had just walked in out of the heat and had allowance money to spend! The arcades, especially the long-standing Time Out, also helped relieve me of those allowance dollars. In 2009, I took my girlfriend to Roanoke to show her where I grew up. We visited Tanglewood, and while I had already seen it with the fountains removed, I was shocked at how many of the store fronts were empty and papered over. The French Quarter was long gone, as was the food court. If memory serves me, the spot where Time Out entertained and (pick-pocketed) so many young people is now a battery store tended by a fat, surly guy who seemed to be marking time until the end of his shift, maybe of his whole job. The remaining stores were an incongruous mix, seemingly at odds with one another. Reasons given for the malls' demise by other commentators are correct, including the advent of Valley View and the misguided initiative to drive off of loitering teenagers. But more than these, is the very smallness of Roanoke itself. Not having been back for many years previously, I was shocked at how quickly one can drive all the way across Roanoke. About 3-5 minutes on I-581 takes you from the ramp at Valley View to the exit for Tanglewood. What parent isn't going to cave to pressure from their kids to do the back-to-school and other shopping at the "cool mall" where they already hang out, especially since the drive is so easy? Nothing is really out of the way in Roanoke; it is just too small to support 2 or more malls, especially in these dire economic times. Similar fates have befallen the old Crossroads Mall, not far from where Valley View stands, and Towers Mall, a mostly outdoor strip mall, which was also the scene of many childhood memories for me. As a tenant at Tanglewood Mall in Roanoke, VA I must make a correction to this sites comments about it. Tanglewood Mall is being "KILLED" by it's Management Team, not the area, location, other competition, or the mall itself. To be more exact, <deleted>, the "acting" General Manager is a former secretary turned GM. Notice we state "acting" because that's about all she does other than memo employees and tenants as to clean. <deleted>, the "Marketing Manager," is a complete lost soul. The poor thing doesn't even know what her degree from the almighty <deleted> University is supposed to be used for. Seriously, she doesn't market anything, take suggestions, or even memo tenants about "events." <deleted>, the "Short-term Leasing Specialist," is very helpful. Actually, she's so "helpful" she'll tell you ANYTHING you want to hear until she gets your name on a lease. Then the truth comes out. Recently, I've personally seen other stores trying their best to advertise on their own and be successful even though the "management team" is more of an obsticle than help. The mall is at about half full with most not looking to renew their leases once they are up. So, in a nutshell, if <deleted>, <deleted>, and <deleted> were to be let go, Tanglewood Mall would not be on this site within six months to a year. Even the general public knows a lot of the aforemention information and that Tanglewood Mall since this Management Team has taken over is nothing more than a place to WALK. The original mall design represented the height of mid-`70s retail fashion. With three large fountains, dark-stained wood parquet floors, and a plethora of whiz-bang striping, funky lighting and tinted glass, there was little else in Roanoke like it. Even today as the inside is radically different than 1973, the outside still is authentically "Me Decade," and while not fashionable, still quite nice. Tanglewood featured over 120 specialty stores at its peak in the mid `80s, mostly regional chains like Davidsons (menswear), Sidney's (ladies' wear) and Hofheimer's Shoes, but also some national retailers like Hallmark, Waldenbooks, Kinney Shoes, and The Limited. It even featured a "mini-mall" within the mall called The French Quarter with a contrived French village theme and a dozen or so boutiques, including a gourmet restaurant and market. Tanglewood has suffered a slow slide into obscurity since the arrival of its most serious competitor, Valley View Mall, eight miles to the north. 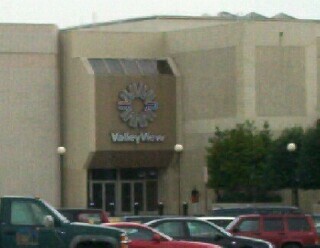 Valley View opened in 1985 and quickly eradicated two large shopping centers (including Steele's Crossroads Mall) within a three-mile radius. The better-managed, larger, and more fashionable Valley View at first happily coexisted with Tanglewood, especially after a major interior renovation at Tanglewood that added softer colors, an elevator and Mediterranean tile accents in 1985. Tanglewood was sold at least three times over a fifteen-year span, with each owner adopting a conflicting retail philosophy. At first solidly middle market, various management companies tried to take the mall upscale, downscale, and several variations in-between to compete with Valley View. No strategy fully worked, although the mall gained a 10 screen Carmike cinema, Applebee's, Mac & Maggie's restaurant, and a Barnes & Noble in the process. Even with the gains, the mall lost a number of key tenants, including Miller & Rhoads (1989) and Brendle's (1996), and even axed The French Quarter for Goody's Family Clothing in 1995. The ever-changing marketing and increasingly odd tenant mix confused and disappointed formerly loyal shoppers. There was also a misguided effort to rid Tanglewood of the crowds of teenagers that gathered on weekends. Of all the strategies tried in this era, this one worked_too well. Teens favor Valley View these days, and their parents (and their parents' money) followed suit. Even after a rather tasteful renovation in 1996, Tanglewood Mall continues to suffer. Brendle's closing left 50,000 square feet of empty space that has yet to be permanently filled over eight years later. The food court has only three restaurants, down from eight at its peak. The Roanoke market has taken strongly to discount retailers (especially Wal-Mart) and trendy shops, of which Tanglewood has few and Valley View has in abundance. Belk has largely downscaled its merchandise mix and appears ready to pull out of the mall at a moment's notice. The largest crowds come from mall walkers who congregate and leave before the stores open. Non-traditional tenants, such as a rescue squad museum, a rescue mission art store, and dinosaur exhibit from the Virginia Museum of Natural History take up prime retail space. National retailers are much more selective with their locations these days, meaning that less successful malls in small markets have to rely on a dwindling pool of tenants. As Tanglewood limps through its third decade, there are about 50 retailers including Foot Locker, Bath & Body Works and Stein Mart, but the mall is steadily losing stores, with few prospects for new tenants. The only thing keeping Tanglewood Mall from outright failure is the strength of the remaining anchor stores (especially JCPenney, T.J. Maxx, and Kroger) and restaurants (including a wildly successful K&W Cafeteria). In this uncertain retail age, those variables can change overnight, turning Tanglewood from a dying mall into a dead mall. Wikipedia has an official entry about this mall, stating major renovations taking place to bring this mall back.